I finished the fence just as our friend Michael stopped by to drop off the generator we’d loaned to him and some other carpenter friends for their trip to Standing Rock. So Michael and I chatted for a time in the driveway, sharing little pieces of our lives. We do that pretty well. For men, anyway. The snow was still barreling down, maybe an inch-and-half, two-inches on the ground already. I was cold, but felt warmed by the presence of my friend, by the lingering image of the cows at their hay, and strangely, I think, by the snow itself. The energy of it. The insistence of it. Michael departed, and I walked up the hill to the house, lit and warm by my family’s bustling activities within. Outside, it was dark enough now that I could no longer see the cows from twenty feet away. But as I passed by, I heard the distinctive sound of their chewing, interspersed by the rustling of hay as they nosed for the tender bits. The snow letting up a bit now. Soon to stop. 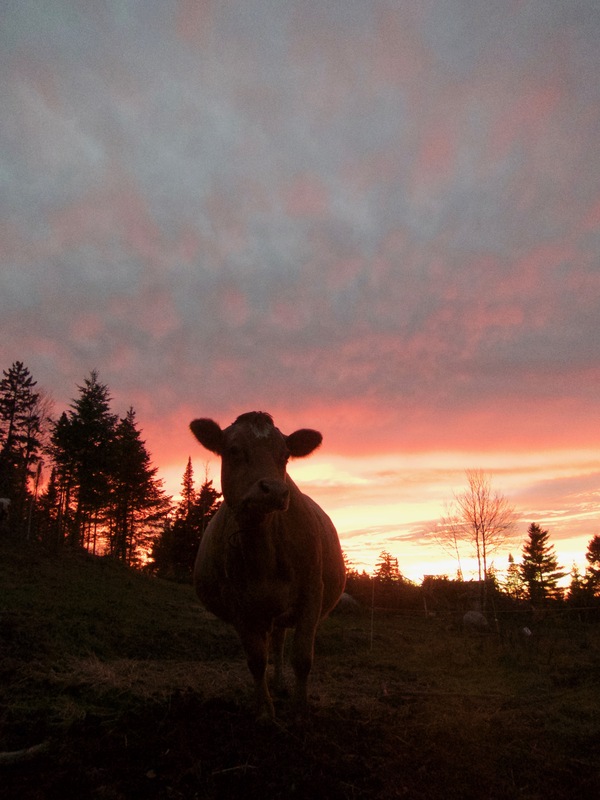 Love the thought and sound of cow munching…. This makes me feel peaceful so I thank you! Dusting off those skis yet? There are days that I wish I could boycott life. Pondering the sky turning to dusk would be time better spent. Strong imagery, lovely moment. I enjoy your reflections Ben. as always, you convey a lot with simple words, bravo! How is trapping season going for Fin & Rye? Nice cow picture. Please tell your friend Michael “thank you” from me for going to Standing Rock. I am a unfortunate landowner with two NW Iowa farms affected by the Dakota Access (DA) Pipeline. I would like to have been at Standing Rock or some of the other protests but chose instead to make My Stand on our land. Whenever the workers were/are there, I was/am there, watching, asking questions, asking them to do things differently, making myself heard. I want these folks to see and know who they are affecting. With every conversation, I let them know that I am an unwilling landowner and that I feel betrayed by the State of Iowa who gave DA a permit along with the right of Eminent Domain. I have done this for myself and my family and my ancestors and my descendants. I thought it might help me feel better to watch this slow-moving train wreck occur but it has not. For me, everyday that there is no oil in the pipe that is now buried 4 feet under our land will be a blessing.